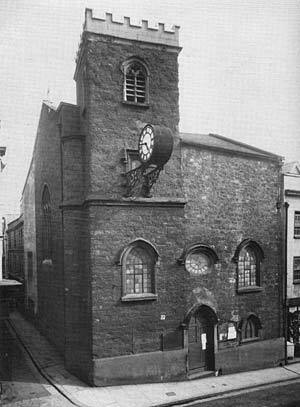 St. John's Church, Fore street hill, is another of Exeter's lost churches, although in this case, it was demolition rather than bombs that removed it from the street scape. The earliest mention of a church on this site was when it was included as one of the nineteen churches of the city, in 1222. Along with St George's in South Street, the church was appropriated by the Priory of Plympton until the Reformation. In 1656, an ordinance of Parliament stated "... that for better promoting and preaching of the Gospel" all but four churches of Exeter were to be sold as burying places or schools and St John's was sold for £100. On the restoration of Charles II, the citizens purchased the church back. Later, St John's Bow was one of several places in the city that the proclamation of a new monarch was made. Charles II on the 11 May 1660, and George I after the death of Queen Anne were proclaimed at the Bow by the Mayor, Aldermen, Members of the Common Council and city officers. Other events such as the peace with France, signed at Amiens in 1802 were also announced there. The Municipal and Cathedral records note that during the reign of Charles I the weekly market for cattle and hides were at St John's Bow, while the meat market was held at the shambles in South Street. Horned cattle of every size and shape, held on ropes, would stand in front of the church, bellowing in confusion. Straw and dung was heaped on the street, while farmers and butchers struck their deals before the animals were led off to the butchers temporary pastures, or straight to Butchers Row at the end of John Street for immediate despatch. The tower was very similar to that of St Lawrence in the High Street, although it had a circular projecting staircase which culminated in a small, side tower. It was constructed of red sandstone, while the exterior was cement rendered, but some time in the nineteenth-century it was removed and the stone blocks redressed. (1) T. Mears, of London. This bell was added to the peal of the united parishes of St. John and St. George at the rebuilding of the church in 1843. (2) Glory be to God on high, 1740. (3) Peace on earth. T.W. 1740. (4) Good will towards men, 1740. T. Wroth cast us all. (5) Fear God honnour the King. T.W. 1740. (6) Revd. Thomas Billington minister. Richard Takill, Nath. Cross, wardens. To means of grace to life I call, the news of death I bring to all. W. Wroth fecit. 1740. Internally, the floor of the nave was above the level of the street due to the slope, and there were steps leading up from the front arched entrance. In 1843, the interior was remodelled, and galleries added to increase capacity to 400, after the church of St George was demolished to widen South Street, and the two parishes were merged, to reopen on 12 August 1844. Despite the parishioners spending a considerable amount on improvements, including replacing benches with pews, the interior was incapable of holding a larger congregation. A small room was once used by a cobbler but was appropriated for use as a vestry when the amalgamation took place. The internal gallery had a shield of arms dated 1671. 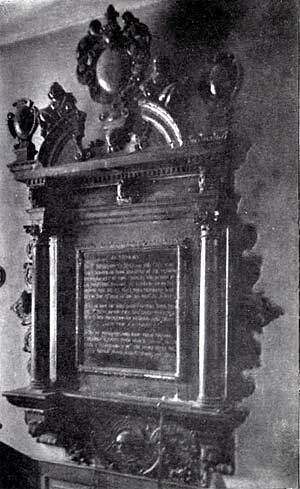 A marble monument to Sir Benjamin Oliver and his wife dated 1672 was in the nave. Oliver was knighted when Mayor by Charles II in 1671, when the king was journeying from Plymouth to London. Other monuments included William Chilcott dated 1711, Thomas Baron, Mayor in 1705, dated 1718 and Richard Vivian, dated 1740. The baptism and burial register dates from 1682, and that for marriages from 1683. The chancel was on the north side of the church, over a bow commonly known as St John's Bow, that crossed John Street, similar to St Stephen's in the High Street. John Street was a popular access point to Butcher's Row from Fore Street. James Cossins wrote "The cart entrance to the Butchers' row was under St. John's Bow, the arch being so low that carts were obliged frequently to partially unload." The improvement work of 1843 utilised the chancel to increase the capacity of the church. Over the next years, the condition of the bow deteriorated requiring it, by the 1860s, to be propped up due to its poor condition. In 1863, the rector and churchwardens were prosecuted by the Improvement Commissioners for permitting an obstruction of the highway caused by the props and they were bound over to remedy the situation for a payment of £50. Consideration was given to repair or replacement, and considerable committee time spent discussing the cost. Rent for the bow was paid to the Duke of Cornwall, Lord of the Manor of the city, but the venerable Duke lost his rent by 1865 when the bow was demolished, as the expense of repair proved to be too high. The wall wall was made good, and a new window inserted. In October 1845 the clock that was such a prominent feature of St John's, overhanging Fore Street, ensuring the locals were aware of the time at all times, had a new silver minute hand fixed to its faces, alongside the gilt GMT minute hand, to enable both Exeter time and Railway time to be shown. Exeter is 14 minutes behind London, and before instantaneous communication, each town would have its own adjusted time calculated against Greenwich Mean Time – the railway companies did not adopt GMT until 1847, so St John's, Exeter was ahead of its time! The City of Exeter caught up when in October 1852, after a public meeting at the Guildhall, the Mayor agreed that the Cathedral clock, and all other public clocks would be set to indicate GMT. The matter of the clock was raised again, when in November 1853 the Improvement Commission took a deputation from St John's parish to consider the installation of an electric clock. The old clock was by now in very poor condition, and would often show the wrong time, thus misguiding people. It was agreed to consider the matter and have someone investigate and report back. The next month the commission were presented with the facts. It was thought that a suitable two dialled, illuminated clock driven by a battery would cost £80 to £100, with the battery costing 30 to 40 shillings per year. The committee then did what all committees do and put the proposal to a larger committee. Eighteen months later and a London clockmaker was approached to make the new clock – in the usual way, letters of objection appeared in the Flying Post – "How is it that a London tradesman has been employed to set up the new clock at St John's?" and "could no one be found in Exeter competent to undertake the business?" One letter, from a High Street clockmaker complained that he would have done the job for £130, while Dent's of London were to charge £220. The clock was installed without further complaint, and after a few years, it was given the name "the moon of Fore Street." 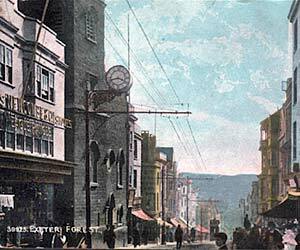 On the occasion of the Prince of Wales wedding in March 1863, all the shops of Exeter were decorated – "St John's Church clock was surmounted by a crown, but its exposed position allowed the wind too much play upon the gas, and the effect was destroyed." By the 1880's, the church was very run down and in need of repair. In 1882, the parish was impoverished, requiring the Rev. John Popham to use £100 of his own money to renovate the fabric. When the work was completed, the Mayor and Corporation were invited to a grand opening. A large procession of dignitaries proceeded down Fore Street headed by a posse of police, to take their reserved places in the church for the opening service. By 1889, the good reverend was again asking for funds for emergency repairs to the tower. The end came for St John's Church, Fore Street when it was decided to demolish it, in 1937, along with St Paul's Church. St John's Church, corner of John Street and Fore Street was on a sloping site. The circular projecting staircase can just be discerned in John Street. St John's Church, showing the projecting clock. 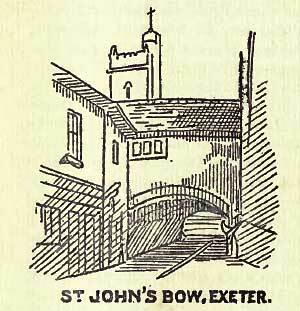 A 1902 illustration of the bow from John Street looking towards Fore Street. Notice the round tower. Monument to Sir Benjamin Oliver in St John's.